The Puggle came into existent with the crossing of two breeds, The Pug and The Beagle. These breeds of dog are also known as designer dogs and are very popular with dog’s lovers. This breed of dogs has a lovely and noble expression, they are energetic and athletic and have a long body like the Beagle dog breed, they have beautiful large round eyes. The Puggle is active, brave and a lovely dog, they are very attached with their masters and can become destructive if they are left alone for some extent of time. They do well with children and older people. This breed requires early age socialization and can do well with other small pets if they are properly socialized with them. They are friendly with strangers and do well with them, but will alert their family if they hear some noise or saw any stranger. The coat of the Puggle is dense and short in texture. This breed of dogs is a good learner but some times they are difficult to train. Training should be given with fairness and patience they will not respond to any harsh and hard methods of training. This breed of dog requires regular exercise to remain fit they are ok in apartments if proper exercise is provided to them. They love to go for a long walk and enjoy the family play sessions. This breed of dogs require occasional brushing to prevent dirt and dead hair, bathing should be done when needed. With this dog breed it is important to clean the ear on regular basis to avoid any infection of the ear. 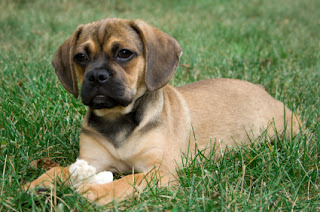 Like other dog breeds the puggle also is prone some some breed specific health problems and dog diseases, these include heat intolerance, skin infections, eye infections, and respiratory problems. As a dog owner it is your responsibility to keep a watch out for any symptoms of diseases in your dog and if you notice something strange consult a vet at the earliest.